Mary Gustanski, is Vice President of Engineering & Program Management, Delphi Automotive Systems. In this role, she is responsible for driving common process within the global engineering organization. This includes leading the program management and flawless launch process as well as enabling improvement in execution through greater discipline during the Product Development Process. 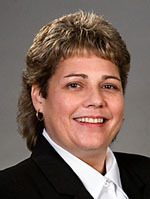 Gustanski began her career with the company in 1980 as a College Cooperative Student at the former AC Spark Plug Division of General Motors, in Flint, Michigan. Mary was hired full time as an Associate Manufacturing Engineering in April 1985. She held several positions in Engineering and Manufacturing, including Sr. Manufacturing Project Engineer, Sr. Project Engineer and Production Superintendent, prior to being promoted to the Executive level as Divisional Plant Quality Manager in 1997. Gustanski then became Chief Engineer for Generators in 1998 and was promoted in 2001 as Technical Center Director. In 2003, she was promoted as Global Director of Manufacturing Engineering. Gustanski was appointed as a member of the Powertrain Systems Executive Staff in 2006 as the Divisional Director of Engineering, Customer Satisfaction and Program Management. In 2012 she was named as Powertrain’s Vice President of Engineering, Operations & Customer Satisfaction. In August, 2014, Gustanski was appointed to the Corporate Engineering Team as the Vice President of Engineering, Launch Readiness and Program Management. Gustanski holds a bachelor’s degree in Mechanical Engineering as well as a master’s degree in Manufacturing Management, both from Kettering University (formerly GMI).